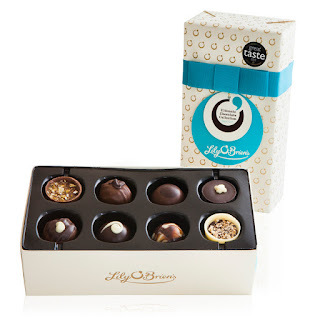 As you know, Lily O’Brien's ran out of packaging for the Triple Chocolate Indulgence - which we love! They very kindly gave us an upgrade but as I explained before, not all of our baskets are big enough to fit the massive new box of chocolates and therefore not everyone would receive the upgrade. Feeling a tad exasperated we went back to Lily O’Brien's, surely they could help us out one more time. Needless to say, not one to disappoint they came through. Upgrading us once again! By explaining the dimensions of our basket and the type of product we had in mind, Lily O’Brien's suggested The Ultimate Collection. Ultimate by name and opulent by nature. 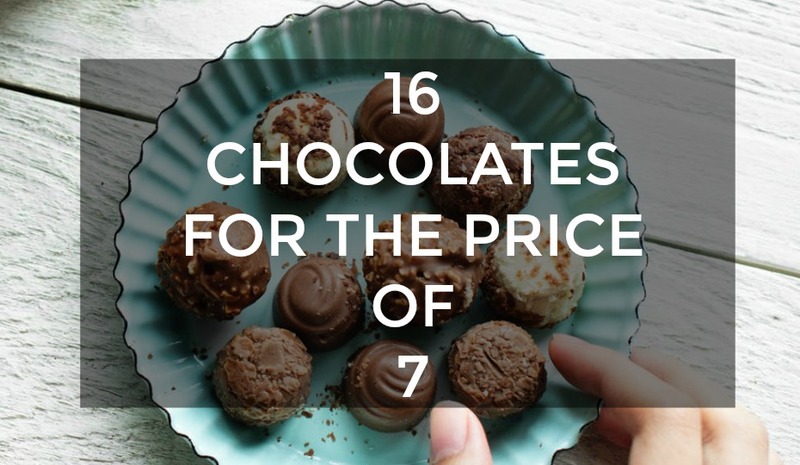 An array of 16 finely crafted Irish chocolates with a recommend retail price of €10 meaning it works out at 62c per chocolate. Le Crunch Chocolat - Buttery crumbs of sumptuous caramelized French biscuit delicately mixed through our very own creamy milk chocolate to delivery a very unique chocolate with a crunch. 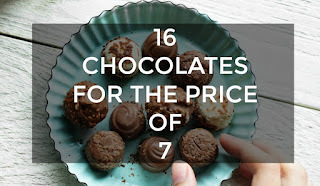 Double Chocolate Truffle - single origin 68% dark chocolate layered with velvet smooth 55% dark chocolate truffle smothered in milk and dark chocolate. Zesty Orange Chocolate - Rich chocolate ganache infused with Brazilian orange oil and sprinkles of orange pieces smothered in delicious milk chocolate. 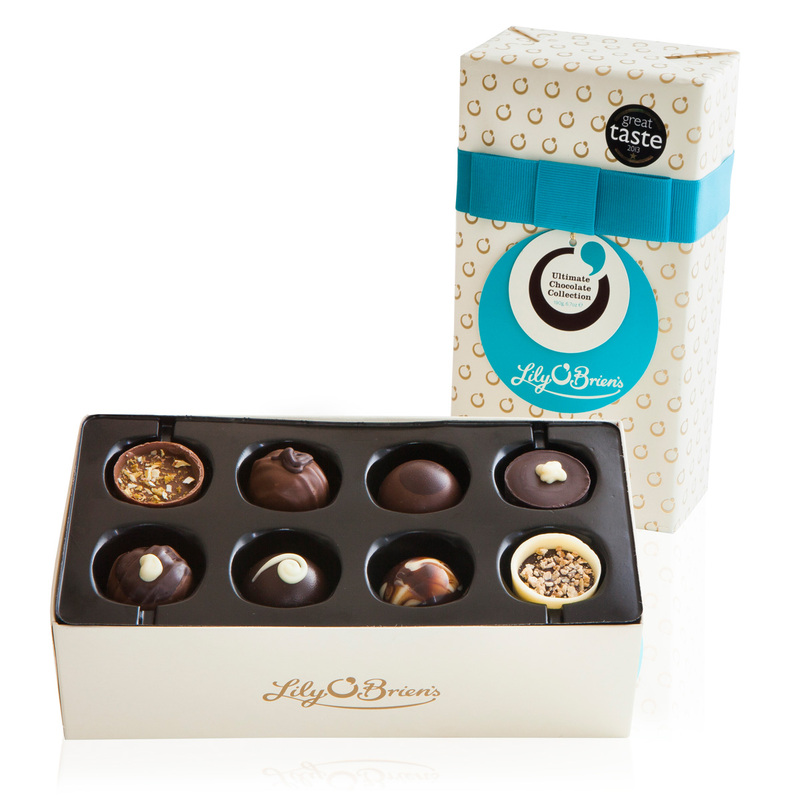 Sticky Toffee - sweet, sticky and smooth caramel coated with milk and dark chocolate - a Lily O’Brien's classic! Death by Chocolate - a dark chocolate shell filled with deeply delicious dark chocolate ganache. Lemon Meringue Pie - Truffle infused with zesty lemon and coated in luxurious dark chocolate. Simply Chocolate - sweet white chocolate is combined with scrumptious dark chocolate to create a simple yet mind blowing flavour. Praline Perfection - crunchy praline in an indulgent white chocolate cup topped with a dark chocolate ganache and sprinkled with crushed hazelnuts. 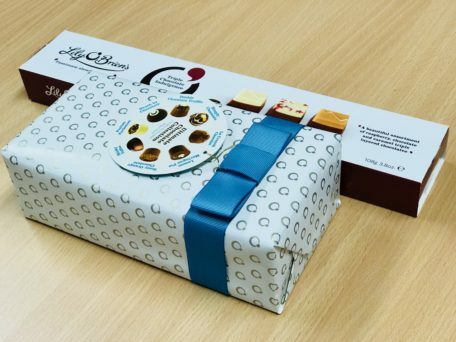 As you can see this product is literally the ultimate chocolate treat to have this festive season - a sumptuous array of 16 mouth watering chocolates finely crafted by Ireland’s top chocolatier and beautifully hand wrapped in cream paper with a teal ribbon to accent. An unbelievable upgraded with no addition cost to yourself. Not to worry, if you have already ordered a gift hamper containing the Triple Chocolate Indulgence it will be upgraded to the beautiful Ultimate Collection. Once they are gone… they are gone. So make sure to get your orders in ASAP!